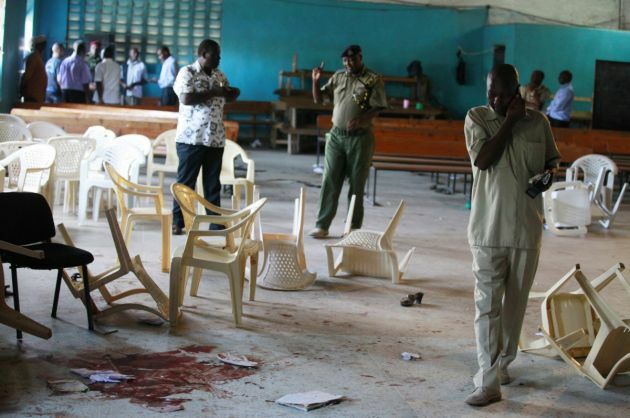 MOMBASA, Kenya (Reuters) - Gunmen shouting in a foreign language killed six worshippers in a church near the coastal city of Mombasa on Sunday, an attack of the kind that Islamist militants have been carrying out in retaliation for Kenya's intervention in neighboring Somalia. Witnesses said the attackers burst in through the church's back door before shouting out and opening fire on the congregation. "Both carried big guns and began shooting all over the place. I fell to the ground and could hear screams," said Lilian Omondi, who was leading a prayer meeting at the time. Blood-spattered Bibles and overturned plastic chairs and bullet casings lay strewn across the floor. The attackers tried to raid a second church nearby but fled when armed police on patrol in the area appeared. A top Interior Ministry official later said they had escaped, and there was no immediate claim of responsibility. The Somali Islamist militant group al Shabaab and its local sympathisers have carried out similar attacks in Kenya, some of them on churches, in revenge for the Kenyan army's intervention against al Shabaab in Somalia. The Kenyan coast's large Muslim minority, many of whom feel marginalised by the predominantly Christian government, have been a fertile recruitment ground for Islamist militant networks. Breaking up those networks has become a priority for the Nairobi government, but moderate clerics say its heavy-handed tactics have fuelled resentment among Muslim youths. Kenyans are increasingly alarmed at the relative ease with which militants appear to move around East Africa's biggest economy - a recipient of U.S. counter-terrorism funding. Parliament called for better coordination between the security and intelligence agencies after 67 people were killed in an al Shabaab attack on a shopping mall in Nairobi in September. Local police chief Robert Mureithi said Sunday's assault had "all the indicators of a terrorist attack because the attackers did not steal anything and appeared focused on killing". Police threw a dragnet over the Likoni neighbourhood, where the shooting occurred, rounding up more than 100 youths for questioning, Mureithi said. Two people were killed at the church and four more died of gunshot wounds in hospital, according to the Kenyan Red Cross. At Mombasa's main hospital, doctors handed reporters x-rays showing bullets lodged in the skulls of a 2-year-old boy, whose mother was killed, and a male adult they were treating. "The attackers have not done this on behalf of any religion or right-thinking group," said Sheikh Juma Ngao, a prominent Muslim cleric in Mombasa. "If they are hoping to drive a wedge between religious groups in this region, then they are greatly mistaken."